Army Public School (APS), Ambala Cantt. has recently given notification of various PGTs, TGTs, PRTs, and PET Vacancies on the ad-hoc basis. You can send your application for the APS Ambala Cantt. Recruitment 2019 on or before 25.02.2019. Army Public School Ambala Cantt. Recruitment 2019-20 latest notification is out. As per the Notification, there are various PGTs, TGTs, PRTs, and PET Vacancies. The educational qualification is as per the CBSE Bye-Laws. The maximum age limit is 40 and 57 years. 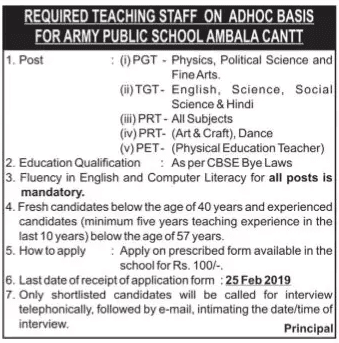 If you are looking for Teaching Jobs in Army Public School Ambala Cantt then this article is going to be very helpful for you. Name of Department: Army Public School, Ambala Cantt. As per the CBSE Bye-Laws. The upper age limit is 40 years for the fresher candidates and 57 years for the experienced candidates. As per the School rules/ AWES rules. You can get the prescribed application form for Rs. 100/-. You can send your application to the department on or before 25 February 2019. You can check the APS Ambala Cantt Result or Interview List from the official website.